The glamor is always thought to be a play of only Hollywood divas. Here steps up Michelle Obama to prove it's a feat for every woman. Her political presence collaborated with glitz is a scene to watch keenly. 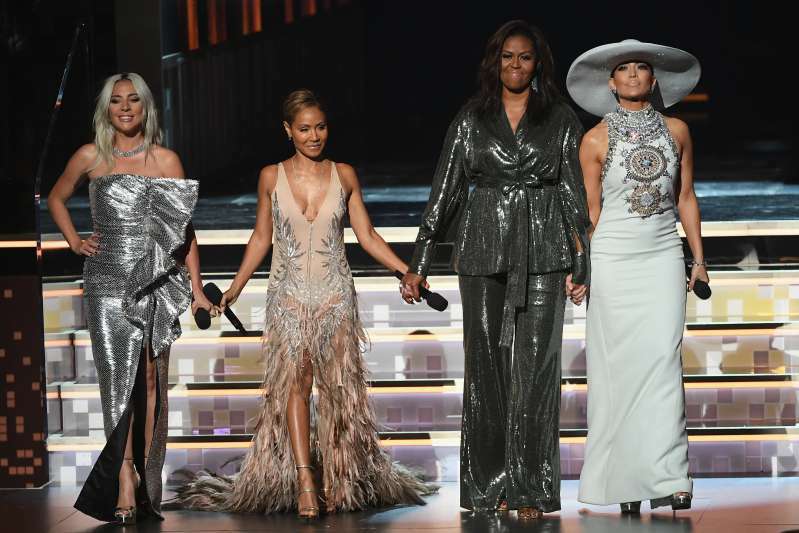 The 61st Grammy awards was an amazing night celebrating music held on February 10, 2019. As usual, it was a star-studded event with beauties twirling all around. The magical eve was hosted by the Recording Academy to honor the most remarkable musical contributions made by songwriters, producers, engineers, mixers, and artists. Probably, the most unforgettable moment of this ceremony was when Michelle Obama surprised everyone. 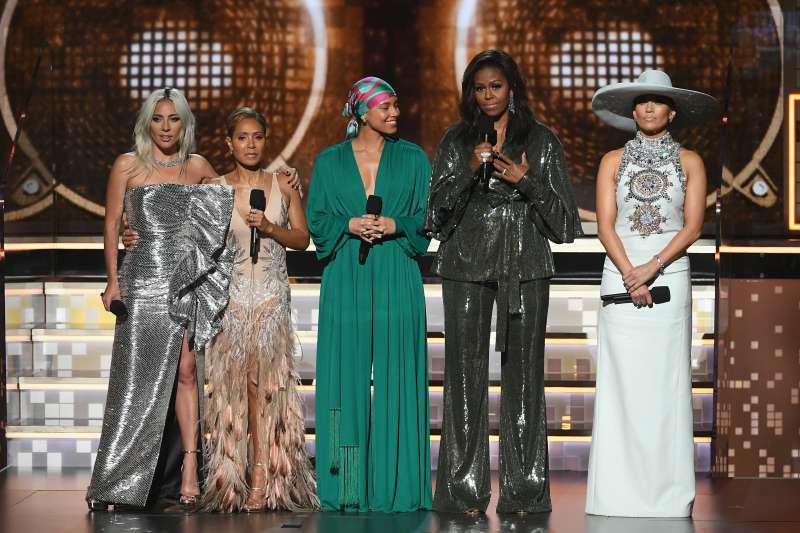 The former First Lady joined the stage with Jennifer Lopez, Lady Gaga, Jada Pinkett Smith, and Alicia Keys to express how music has always helped her to tell her story. The Staples Centre was brought to life as her fans loudly cheered for her and blew kisses. Michelle absolutely stunned in a billowing silver blouse paired with matching slacks that featured a sparkling belt wrapped above her waist. This dazzling ensemble is one of Sachin & Babi masterpieces. After slaying with her looks, the gorgeous lady gave a heartfelt tribute to music. The Twitterverse presented her great applause. They were in awe of her elegance and loved her choice of dressing at the awards. Represent Michelle. Thanks for being the strong and outgoing ndividual and female that you are. Grace Michelle pure Grace YOU ROCK.!!! TOTAL CLASS! All of you! ❤️you! 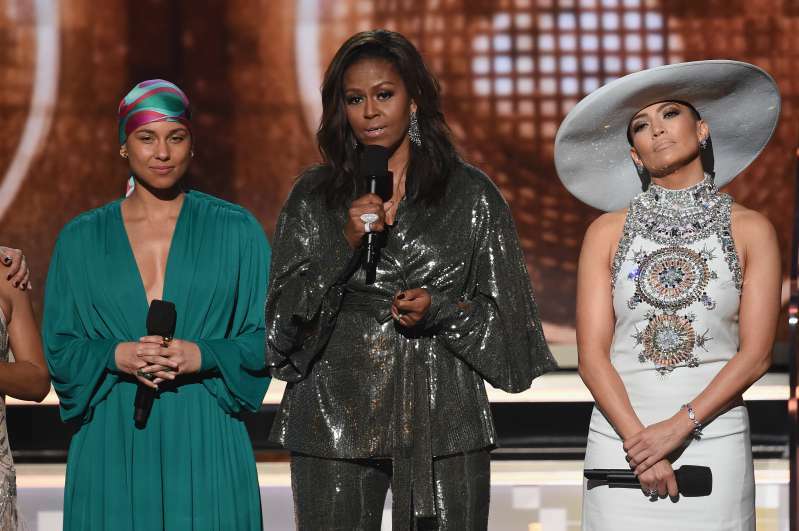 Were you pleasantly surprised by Michelle Obama's attendance amongst the superstars? Share this and let us know if you believe her to be just as awesome.